Biondo Cement is Rochester most trusted Exposed Aggregate contractor. 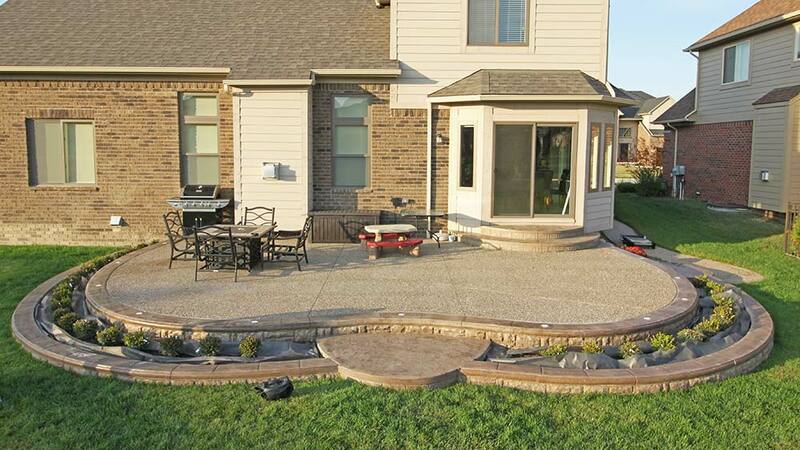 We have been installing beautiful Exposed Aggregate Driveways, Exposed Aggregate Walkways, and Exposed Aggregate Patios in the southeast Michigan area for over 25 years. If you’re looking to have a beautiful Exposed patio installed, look no further – with our endless range of design options, colors, finishes, decorative accents and more, we have the know-how and the expertise to match the concrete installation to your home’s unique style. When you come to the Biondo Showroom to get started on your Rochester Exposed Aggregate creation, you will get a chance to work with our in-house design team on the specifics of your project. We have over 80 patio designs to choose from, or you can create your own style from scratch! For patios, walkways, driveways, and more, you will get a 2d blueprint of your proposed design which will then be used in the installation process. If you get a patio, you also get a FREE 3d design, which you will help create, showcasing your new patio on the back of your home!This takes the guesswork out of design creation, so you can see exactly what your new Rochester Exposed Aggregate creation will look like. Exposed Aggregate is a great choice for your Rochester patio project. Why? Exposed aggregate is beautiful, durable, and cost-effective. It gives an exceptionally classy look to any patio design. With all different manners of colors, finishes, and decorative accents to choose from, you can create a patio that’s as unique as your own style, and that compliments the structure and color of your home. If you are seeking a Rochester Driveway Replacement or Driveway Installation, consider getting an Exposed Aggregate Driveway! Exposed Aggregate will make your home stand out, adding a sense of luxury and style that is can’t be faked. Exposed Aggregate is very durable, so it can handle all your driving and parking needs! Moreover, with a wide selection of colors, finishes, and accents, we can create a custom color and border scheme that matches your garage and home to create a seamless, integrated look. When you come to the Biondo Showroom to get started on your Rochester Exposed Aggregate creation, you will get a chance to work with our in-house design team on the specifics of your project. We have over 80 patio designs to choose from, or you can create your own style from scratch! For patios, walkways, driveways, and more, you will get a 2d blueprint of your proposed design which will then be used in the installation process. If you get a patio, you also get a FREE 3d design, which you will help create, showcasing your new patio on the back of your home! This takes the guesswork out of design creation, so you can see exactly what your new Rochester Exposed Aggregate creation will look like. Once your design is finalized, we will then begin your Rochester concrete project. We begin by removing all dirt and concrete where necessary. We then specify a construction area. Then, we build the framework that will house your concrete creation. Next, we install crushed concrete as a solid base and compact it to ensure a solid footing. 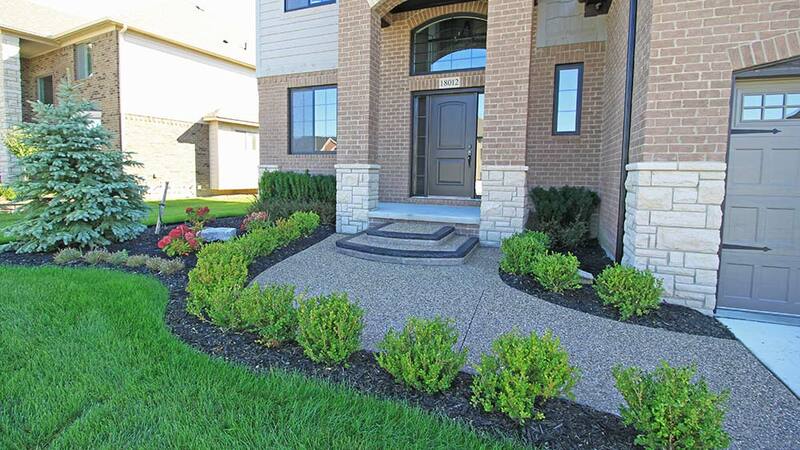 There are many benefits to choosing exposed aggregate for your Rochester home, such as being highly durable, visually appealing, cost effective, and requiring low maintenance. When choosing Biondo Cement for your next concrete project, you are backed with over 25 years in the concrete industry, so you can rest assured that we have the experience, knowledge, and professional staff to design and build the perfect concrete project that will bring your visions to life! Homeowners in Rochester, MI are discovering the many great advantages to exposed aggregate concrete. Biondo Cement Co. is a Michigan based concrete contractor, fully licensed and insured, a member of the Better Business Bureau and is your local decorative stamped concrete contractor located in Rochester, MI.